Target Instant Win Game ~ Win a $25 Gift Card Now thru Dec. 15th! 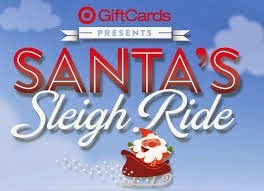 Play Santa’s Sleigh Ride presented by Target and you could instantly win a $25 Target Gift Card. 100 Gift Cards will be given away daily thru Dec. 15th. Once you play, you will also be registered to win the Sweepstakes Grand Prize… A $1000 Target Gift Card! Previous postKrispy Kreme ~ FREE Dozen Doughnuts! Next postPrint this Rare $0.35/1 Pepperidge Farm Goldfish Coupon Before it Disappears!